We know December is a busy month, but make time to attend our upcoming webinar with our CEO, Saar Levy. Saar will speak about the CEDEX project and will answer all of your questions. Webinar – Tuesday December 19th. We know December is a busy month, but take some time away from your holiday prep to attend the webinar this Tuesday, December 19th 2017 17:00 (GMT+0) with Cedex co-founder Ronen Priewer, a veteran in the diamond industry to explore new horizons for the diamond industry. Ehud D. Cohen chairman of the board and founder of IDEX business, has actively managed the business from its inception in 1999, pioneering the first international online B2B diamond trading platform. During the 15 years preceding the formation of IDEX Online, Ehud managed EC Diamonds B.V.B.A., a global diamond trading company which he established in 1985. During these years, he lived and operated in all the main diamond production centers – New York, Antwerp, Mumbai and Ramat Gan, establishing the company’s trading network worldwide. Ehud is IDEX’s largest investor. 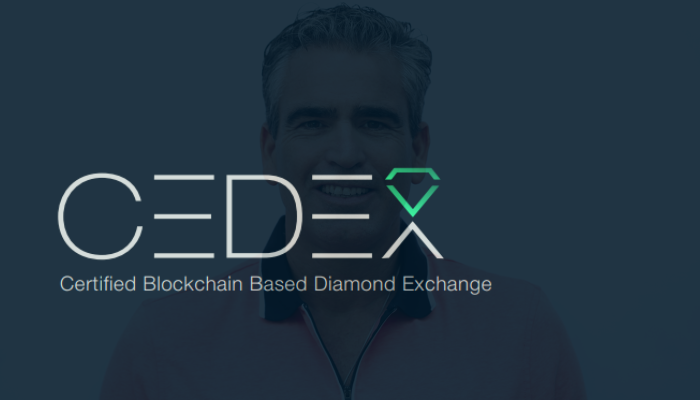 CEDEX represents the world’s first certified, blockchain-based diamond exchange, here to bridge the gap between the diamond industry and the investment market. To help learn more about the company and its upcoming platform, The Merkle has conducted an interview with Saar Levi, the CEO of CEDEX. Drake is the Chairman of LDJ Capital, a family office based in NYC; Victoria Partners, LDJ Real Estate Group; Drake Hospitality Group; and, The Soho Loft Media Group. LDJ Capital's extended network of funds of funds and hedge funds manages 1.5 trillion USD in assets. David previously represented the US Commerce Department at the EU and he spoke at the UK Parliament. Mr. Drake’s access to 100,000 investors is maintained through his media holding investment The Soho Loft Media Group which has produced and sponsored over 1500+ global finance conferences since 2002. David Drake is actively involved in the crypto community as an advisor and speaker and has helped blockchain firms he advised raise $101M in funding through their ICO. ‘Promising lead’ or ‘Back to the lab’? A sparkling, beautifully cut and polished diamond presents class, elegance, sophistication and value, but more than this, it represents financial stability. Diamond is the asset having potential of being leveraged for monetary gain. CEDEX, a certified, blockchain based diamond exchange and trading platform bridges the gap between an existing diamond ecosystem and financial markets. Possessing expert and profound industry knowledge, the team at CEDEX intends to empower investors to invest and trade in diamonds through a simple and streamlined process, similar to that of traditional asset classes. You've got questions, our Founder Ronen Priewer has answers! Do not forget to SIGN UP for the Webinar AMA coming up 2 Jan 2018, at 5:00 PM (UTC, GMT +0). You have to register first to attend! What happens when you combine Blockchain and Diamonds? How would Diamond valuation full transparency impact the diamond industry? To all our CEDEX community! We have some exciting news to begin 2018! As a result of high demand, new opportunities and regulatory developments, our pre-sale will be increased from 20% of total tokens offered to 50% and will be rescheduled. The new token pre-sale date is now: Friday March 16th, 2018 at 19:00 GMT. There has been an extremely high level of interest in the CEDEX Coin on the token sale whitelist, and it has received substantial SAFT contributions, indicating that a 20% token pre-sale would likely fall well short of meeting the total demand. This has lead us to increase the sale amount to 50%, presenting a new opportunity for public investors, as 25,000,000 CEDEX Coins out of the 50,000,000 total publicly offered tokens will be available in the pre-sale. The remaining CEDEX coins will be made available through the public token sale. Another significant benefit of the date change is that it allows for the Japanese market to participate in the token pre-sale. The Japanese Financial Services Agency (FSA) has recently decreed that tokens be registered on a Japanese regulated exchange prior to a token sale. Japan has long been a leader in cryptocurrency adoption and investment and represents a major potential market for CEDEX. As such, we felt obligated to our partners and participants to reschedule the pre-sale in order to accommodate the Japanese market. The extra time will be used to try and complete the regulation process and allow our Japanese contributors to participate in the token sale. For any questions the team will be available to answer on our communities. For the first time, CEDEX will empower the public and enable them to invest safely and transparently in diamonds. With a precise valuation of the assets in place, no previous experience in diamond trading is even needed. Here at CEDEX, we’ve started 2018 at full speed, seeing increasing interest in our project in Korea and Japan as well as other major markets. Just a quick reminder: the new Token Pre-Sale date is Friday March 16th, 2018 at 19:00 GMT. We have increased the amount of tokens to 25,000,000 which means that in the pre-sale we will be selling 50% of the CEDEX Coins. We expect the new date to open the door for the Japanese market, enabling us to meet their specific needs. Due to the high demand and the flood of new requests we’ve received, this week our Co-founder Ronen Priewer will be presenting another webinar. This time it will be at a more convenient hour for our Asian followers so that they can also take part and join the discussion. 1. Back Office - We have built a new back office that will allow us to manage the ICO effectively and better monitor its progress. This advanced system will allow us to provide virtually instant support to our contributors so they receive the assistance they need, the moment they need it. 3. Personal Zone - Soon we’ll release a new personal zone on our site, where you will be able to find data relevant to you, such as your tokens, invite a friend campaign results, and any newly earned bonus tokens. 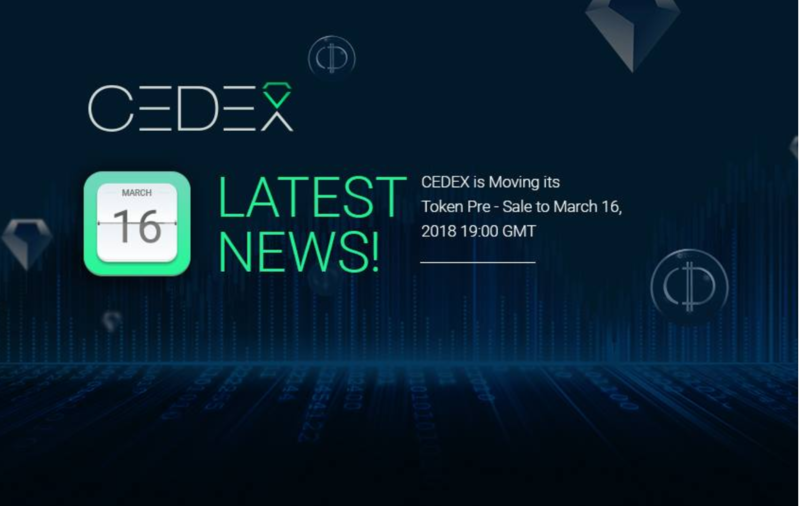 Please note that CEDEX will not be selling tokens before the actual token pre-sale taking place on March 16, 2018, at 19:00 GMT. Any emails regarding acquiring CEDEX tokens before the date above (apart from weekly newsletter updates) are attempts by scammers. If you receive any emails about token sale acquisition before March 16, 2018, at 19:00 GMT, please contact our support team. To proclaim such a bold statement as that stated in the headline, one must first describe the elements of the theory and portray the different layers methodically as if standing in front of an esteemed Grand Jury. This ensures that all the parts of the story match perfectly as not to create a false big bang theory. Pre-Sale Increase from 20% to 50%. The new Token Pre-Sale date is: Friday March 16th, 2018 at 19:00 GMT. The minimum amount of contribution for the pre-sale is 1 ETH, and there will not be a minimum for the public sale. There has been extremely high interest in CEDEX Coin on the token sale whitelist and from SAFT contributions. From that, it became apparent that a 20% token pre-sale would likely fall well short of meeting the total demand. As a result, we have decided to increase the sale amount to 50%. This represents a new opportunity for public purchasers, as 25,000,000 CEDEX Coins out of the 50,000,000 total publicly offered tokens will be available in the pre-sale. The remaining CEDEX coins will be made available on the public token sale. Another significant benefit of the date change is that it opens the door for the Japanese market to participate in the token pre-sale. The Japanese Financial Services Agency (FSA) has recently clarified their stand on Initial Coin Offerings and established a requirement that tokens be registered on a Japanese regulated exchange prior to a token sale. Japan has long been a leader in cryptocurrency adoption and investment and represents a major potential market for CEDEX. As such, we felt obligated to our partners and participants to reschedule the pre-sale in order to accommodate the Japanese market. The time extension will be used to try and complete the regulation process and allow our contributors to participant in the token sale. While those benefits on their own made postponing the pre-sale a clear decision, the extra time also allows us to make progress on other key parts of the project. First, it enables us to strengthen and expand our partnership program. CEDEX is growing rapidly and garnering interest from both the diamond and cryptocurrency industries. This interest has already led to valuable partnerships with TechFinancials Inc. and IDEX (International Diamond Exchange) in 2017. We will continue to strengthen those existing relationships in the coming months, while also working to create new partnerships with leading industry companies. Additionally, we will continue to develop the product according to the business roadmap. Considering all of these benefits, token purchasers can anticipate a high-quality pre-sale launch come March 16th. You can register for the pre-sale on the CEDEX website, here.